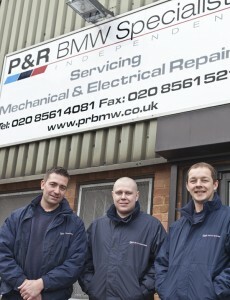 P&R are based in Hayes Middlesex and have been dedicated to offering the best quality servicing and repair to all models of BMW & Mini for the past 13 years. In that time we are proud to have built a reputation for our professional workmanship, unrivalled product knowledge, value for money, and warm friendly service. Our small, passionate team are fully BMW trained and qualified, with over 25 years main dealership experience which has helped to shape the way we think a specialist garage should operate. Our customers benefit from being in direct contact with one of our technicians, not a middle-man or service advisor, and we are equipped with state of the art diagnostic equipment allowing us to efficiently diagnose and repair your vehicle. We also offer a free local collection and delivery service for added convenience when booking your car in. Whether it be routine servicing and maintenance or a complex electrical problem you need look no further than P&R BMW & Mini Specialists – a genuine alternative to main dealer servicing and repairs. P&R are ideally situated to cover a number of counties in West London and the South East of England – Middlesex, Hertfordshire, Buckinghamshire, Berkshire and Surrey; and regularly service vehicles in Hayes, Hillingdon, Uxbridge, Ickenham, Ruislip, Eastcote, Pinner, Northwood, Moor Park, Harrow, Stanmore, Ealing, West Drayton, Slough, Iver, Datchet, Colnbrook, Heathrow, Southall, Northolt, Hounslow and Greenford.